With these words, the ancient Greek philosopher Archimedes taught us the power of leverage points. It’s a key concept in permaculture design, too. When we deeply understand the system we’re working with—be it a garden, a business, a community, or even a personal relationship—we can spot the places where a small, perfectly located nudge will beget a large response. Plenty of disciplines use leverage points. There’s aikido, where a tiny movement by a master redirects the force of an attacker to send the latter sprawling—or worse. In integrated pest management (IPM), the timely deploying of an insect trap at a vulnerable moment in a pest’s life cycle will snare only the target insect while leaving beneficial bugs. Finding leverage points usually requires keen observation and a deep grasp of the system we’re working with. The leverage point I want to focus in this and the next few articles is soil. Soil, that thin living skin of the earth, is the foundation of life. When we use or create healthy soil, a broad gamut of benefits bursts forth: Rich soil sequesters carbon and promotes biodiversity both above and below ground. It grows healthy plants—which in turn grow healthy people and animals. Good soil stores water, reduces erosion, prevents runoff, and stores and exchanges nutrients. It does lots more; the benefits go on and on. Restoring our abused soil taught me a lot, and I’ll detail that story a bit later. After a decade at that site, and ten years of studying, remediating, and rebuilding that depleted soil, we moved north to Portland. Our city lot turned out to be Willamette Valley loam, some of the finest agricultural soil in the world. Plants fairly exploded out of the ground, easily double the size and growth rate of those in our previous place, even after all my restoration efforts. Those combined experiences taught me precisely why farmers value good soil. It’s a lot easier to find it (and preserve it) than to build it. We’re going to cover a lot of ground—if you’ll pardon the pun—in this series of articles. My approach will be different from the way most books and videos teach about soil. I’ll begin with an overview of what soil is made of, and then zoom out for the cosmically big picture of how the elements in soil—carbon, nitrogen, phosphorus, the trace elements, and so forth—are fused together in stellar infernos. That grand story isn’t just an excuse for me to do some cosmic raving. It gives us clues to why these soil constituents are so good at what they do, and we’ll cover that subject next. Once we’ve got all the theory and background, we’ll get practical: how nutrients are held and exchanged in soil and in the critters who live there; words of wisdom and advice from some of the masters of soil science and nutrient-dense gardening; how to tune up your own soil; and finally, my own time-tested method of creating gorgeous garden soil and my recipe for the super, growth-boosting blend of soil amendments that I use to raise lush, nutrient-dense vegetables. First, what’s in soil? The pie chart below shows the make-up of a typical agricultural soil. The components of a typical soil. Image credit: University of British Columbia. 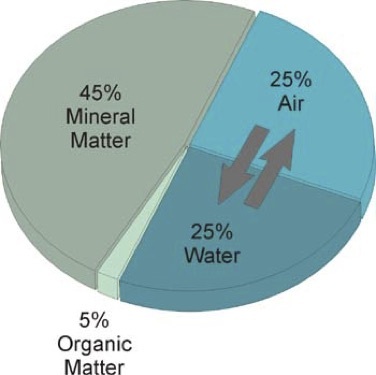 In soil, the amount of air, water, and organic matter (which in the chart includes soil organisms as well as dead organic matter) can vary tremendously depending on how the land has been used, when it last rained, the climate, and so forth. But the pie-chart’s numbers are reasonable averages. In these articles I’m going to focus on the organic and mineral parts of soil. “Organic” in this case means that it is or once was a living thing. The word comes from the Greek organikos, meaning “pertaining to an organ of a living being.” From a chemical point of view, organisms (also from the same root) and organic matter are mostly carbon. We’ll need to spend some time on this miraculous element and how it works so we can understand why soil organic matter is so critical to healthy soil and healthy people. The word “mineral” is a catch-all for stuff that originally came from rocks. It includes sand, silt, clay, and the elements that make them up, such as aluminum, calcium, magnesium, and a big chunk of the rest of chemistry’s periodic table. Minerals and carbon are soil’s main active ingredients. I’ll leave you with the notion that soil has a history as old and as grand as our entire universe. In the next installment, I’ll describe the hellishly hot origins of soil elements and the special qualities that make them the basic building blocks of life and health. This soil series should be a fun, educational, and useful journey. If you have friends who might like to come along with us, please send them the link for subscribing to our newsletter. Here’s the link for the newsletter mailing list: http://eepurl.com/bv-apD . Toby! Can’t wait for class tomorrow! One of my mentors and favorite people right now Justin Maltry the Environmental programs director for Seattle Tilth says “Humans are nothing more than temporariliy animated Humus” I like that better than star stuff, it feels like a more earth based abstraction, and honestly, I beleive we need to spend less time thinking about the stars and more time thinking about the dirt, language directs thought, or so I beleive, and to this end, I try to focus on language and the analogies I use etc… I thought you would enjoy that quote. The healthier our soil, the healthier our bodies! Geosin, discovered in 2012, the molecule which gives soil that earthy smell, stimulates the vagus nerve down to the stomach’s micobiome, our stomach’s wee-beasties send a message back to the brain to release neurotransmitters which make us happy. Just smelling soil makes us Happy. Learning of soil via the macroscope into the dynamic nutrient cycling via microbial communities is such a refreshing perspective from the traditional agronomic soil science courses. This series has provided an essential bridge between disciplines to celebrate the soil as common ground, a life-inducing collaborative pathway of sorts.